Last post I discussed philosopher and educator Peter Boghossian’s ‘crusade’ to help atheists wean christians off their dependence on faith. But is Boghossian’s understanding of faith correct? What do christians mean when they use this word? One of the surest ways to have a frustrating conversation is to be using different definitions of a key matter. This is clearly happening in many discussions between atheists and christians. Peter Boghossian says faith is “belief without evidence” and “pretending to know things you don’t know”. He says “faith is an epistemology” (way of knowing), but an unreliable one. Many christian scholars over centuries have defined faith as trust or confidence, and a practical commitment to God on the basis of good reasons to believe in him. They say faith and reason work together rather than being opposed. The OED’s range of definitions cover the christian scholars’ definition and don’t imply that faith is a way of knowing. None imply lack of evidence (though one includes lack of proof). So OED doesn’t support Boghossian. How does the average christian use “faith”? However Boghossian argues, quite reasonably, that he is not interested in dictionary or scholarly definitions, but in how the average christian uses the word. But then quite unreasonably, he fails to offer evidence for, or examples of, his chosen definitions. I have no more conducted sufficient research than Boghossian has, but my impression is that the average christian will give different answers depending on the question you ask. If their belief is criticised, a christian may respond “you need faith to believe” – thus apparently supporting Boghossian’s view. “Something must have started it all off” – an embryonic form of the Cosmological argument. “Because of Jesus”, and if questioned further, “the gospels are historically true” – basing belief on historical evidence. “God has answered my prayers and changed my life” – based on personal experience. And if asked why they pray, a christian might reply that God has answered prayer in the past so they have faith he will answer again this time. I conclude from this that some christians probably fit Boghossian’s definition, at least some of the time, while others don’t, at least most of the time. But atheist Mike D offers a different view. He analyses 7 different definitions or models of faith and concludes that 4 of the 7 fit Boghossian’s critique, one is meaningless and the other 2 are unhelpful. These two merit examination. Some christians say that faith is the decision to commit to belief in God because it is probable and despite it not being certain. Mike argues that this is reasonable in science, which has a method to test provisional assumptions objectively, but unreasonable for belief in God, because (he assumes but doesn’t actually show) there is no way evidence can settle the question. This seems to me to be weak. Theists believe there is ample evidence to support the provisional assumption. Mike may critique that evidence, but until he does so, his argument is incomplete. He seems to realise this because his final statement is that “faith” is an unnecessary word since we already have “provisional assumption”, which is no argument at all. He also argues another model of faith “needlessly conflates religious belief with ‘trust'”. But this doesn’t invalidate this model, it simply points out that the definition of other words like trust and belief may overlap with faith. Is faith a way of knowing? Some atheists argue that Boghossian’s definition of faith is a red herring, and his main point is to argue against the christian view that faith (however we define it) is a means of knowing (“faith is an epistemology”). But do christians believe this? I suppose some christians may, but most christians do not, even if they may seem to sometimes. I say this with confidence because I remember as a young christian being taught that faith in itself was useless, the important thing was the strength of the object in which faith is placed. It doesn’t matter how much you believe a flimsy bridge is strong, it will be the engineering strength of the bridge that determines whether you can cross safely. So most christians, I think, don’t believe because they have faith. Rather they trust the gospels or they trust their experience of God, or they trust their pastor (which may not always be so wise!). Faith or trust describes their response to evidence, not their reason to believe. Do christians pretend to know things they don’t know? Some undoubtedly do, but to really know that you’d have to define “knowledge”. If “knowledge” = certainty, then I believe no christian can logically claim knowledge for everything they believe – and neither can anyone else! But if “knowledge” = justified belief (as a philosopher might define it), then christians clearly have concluded their belief is justified by the evidence. 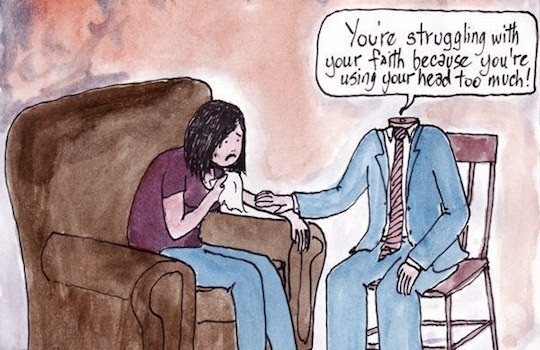 Does faith prevent critical thinking? Again, there is a measure of truth here – christians are generally resistant to evidence that apparently counts against their belief. But so, arguably, is everyone else! Few people change belief easily, and I find it difficult to believe that high profile atheists are any less resistant to changing their beliefs than christians. The fact is that some christians have converted to atheism (just as some atheists have converted to christianity), so they clearly were not totally resistant as Boghossian alleges. So I feel Boghossian is generally mistaken in all these matters. Many people, both believers and unbelievers, are not very reflective. They say things that may be contradictory. Some christians undoubtedly say things about faith that don’t stand up to analysis. But we shouldn’t build arguments against christianity or atheism on the basis of poorly expressed beliefs. believing something we cannot know because of well-based trust in the one telling us (similar to trusting a doctor’s diagnosis). I think I have probably thought most of these sometimes. I think #5 may be the one I would put most value on, with #3 and #4 also helpful. The above definitions have overlapping meanings, and I can see value in all of them. I see no reason why they all can’t be part of what “faith” means. Different people will emphasise different aspects. Faith is a way of responding to evidence or justified knowledge. If these conclusions are reasonable, then we can get back to the real question – is the evidence for christian faith really strong enough to justify believing and following Jesus? Peter has done christians a service. He has exposed some woolly thinking by some christians, even though his own woolly thinking has itself been exposed. Christians need to clarify and learn, and christian philosophers, teachers and writers need to help christians think more clearly. Faith isn’t a reason to believe on its own. The evidence of the truth of christian belief is the reason to believe, and faith is the way we respond to that evidence. I couldn’t have come to that conclusion a month ago. It has taken a lot of reading of internet commentary and quite a bit of wrestling in my mind to reach a new understanding. It has been a good exercise! Do atheists pretend to know things they don’t know? « Who’s afraid of Peter Boghossian?